Who killed Starr -Edwards valve ? Prosthetic valve implantation has revolutionized the management of valvular heart disease . The original concept valve was a ball in a cage valve , still considered as a fascinating discovery. It was conceived by the young Dr Starr and made by Engineer Edwards .This was followed by long hours of arguments, debates and experiments that ran into many months . The silent corridors of Oregon hospital Portland USA remain the only witness to their hard work and motivation. At last, it happened , the first human valve was implanted in the year 1960. Since then . . . for nearly 50 years these valves have done a seminal job for the mankind. With the advent of disc valve and bi-leaflet valve in the later decades of 20th century , we had to say a reluctant good-bye to this valve. There is a lingering question among many of the current generation cardiologists and surgeons why this valve became extinct ? Starr and Edwards with their child ! We in India , are witnessing these old warrior inside the heart functioning for more than 30 years.From my institute of Madras medical college which probably has inserted more Starr Edwards valve than any other during the 1970s and 80s by Prof . Sadasivan , Solomon victor , and Vasudevan and others . It is still a mystery why this valve lost its popularity and ultimately died a premature death.The modern hemodynamic men working from a theoretical labs thought this valve was hemodynamically inferior. These Inferior valves worked like a power horse inside the hearts the poor Indian laborers for over 30 years. The cage which gives a radial support* mimic sub valvular apparatus, which none of the other valves can provide. * Mitral apparatus has 5 major components. Annulus, leaflets, chordae, pap muscle, LV free wall.None of the artificial valves has all these components. Though , we would love to have all of them technically it is simply not possible. The metal cage of Starr Edwards valve partially satisfies this , as it acts as a virtual sub valvular apparatus.Even though the cage has no contact with LV free wall, the mechano hydrolic transduction of LV forces to the annulus is possible . Further , the good hemodyanmics of this valve indicate , the cage ensures co axial blood flow across the mitral inflow throughout diastole. .Unlike the bi-leaflet valve , where the direction of blood flow is determined by the quantum of leaflet excursion in every beat . In bileaflet valves each leaflet has independent determinants of valve motion . In Starr Edwards valve the ball is the leaflet . In contrast to bi-leaflet valve , the contact area of the ball and the blood in Starr Edwards is a smooth affair and ball makes sure the LV forces are equally transmitted to it’s surface . The superiority of bi-leaflet valves and disc valves (Over ball and cage ) were never proven convincingly in a randomized fashion . The other factor which pulled down this valve’s popularity was the supposedly high profile nature of this valve. LVOT tend to get narrowed in few undersized hearts. This can not be an excuse , as no consistent efforts were made to miniaturize this valve which is distinctly possible. Sudden deaths from Starr Edwards valve . Almost unheard in our population. The major reason for the long durability of this valve is due to the lack of any metallic moving points . Absence of hinge in this valve confers a huge mechanical advantage with no stress points. A globe / or a ball has the universal hemodynamic advantage. This shape makes it difficult for thrombotic focus to stick and grow. Science is considered as sacred as our religion . Patients believe in us. We believe in science. A good durable valve was dumped from this world for no good reason. If commerce is the the main issue ( as many still believe it to be ! ) history will never forgive those people who were behind the murder of this innocent device. Cardiologists and Cardio thoracic surgeons are equally culpable for the pre- mature exit of this valve from human domain. Why didn’t they protest ? We can get some solace , if only we can impress upon the current valve manufacturers to give a fresh lease of life to this valve . Aborted and abandoned primary PCI ! It is well recognised for STEMI to get aborted spontaneously or through intervention. Can a glamorous procedure like Primary PCI be redundant ? Yes of course . This paper, is about how a planned Primary PCI can go awry . . . Presented in the Annual scientific sessions of cardiological society of India Kolkatta December 2010. Primary PCI has become the standard of care for acute STEMI in all those eligible patients. Apart from the individual & institutional expertise ,the key to success lies in expediting the symptom to balloon time to less than an hour. Even though STEMI is characterized by acute total obstruction , it is also a fact during this critical time window , a less recognised positive phenomenon takes place within the ill fated coronary artery. Intrinsic fibrinolytic activity gets activiated and begins to take on the thrombus head on .It should be recalled this is the earliest intervention in STEMI by natural forces , with zero time window . The power of this natural lytic process has never been easy to predict and quantiate . But we have often realised such a phenomenon do occur often and is referred by various terminologies like spontaneuous thrombolyis, aboted MI etc .The exact incidence is not estimated .In this era of primary PCI we have found a new opportunity to confirm this concept. It has been observed during primary PCI , an occasional patient may have either a totally patent IRA or a minimal & insignificant lesion like luminal irregularity .This has subsequently led on to cancellation of the procedure .We report our experience with two patients with this particular situation .One patient with IWMI with a time window of 6hours had a totally patent RCA. Even , the luminal irregularities were difficult to locate .The other patient had anterior MI with ongoing ischemic pain.He was taken up for primary PCI.The initial angiogram showed a total mid LAD obstruction . As soon as the guidewire reached the thrombotic lesion the artery opened up wth a TIMI 3 flow .There was no residual lesion or thrombus noted. Both of the above patients were young , smokers . 2b 3a antagonists were not administered. We infered, both had thrombotic STEMI and presumed to had either spontaneous reperfusion , or reperfusion assisted by dye injection & guidewire manipulation. 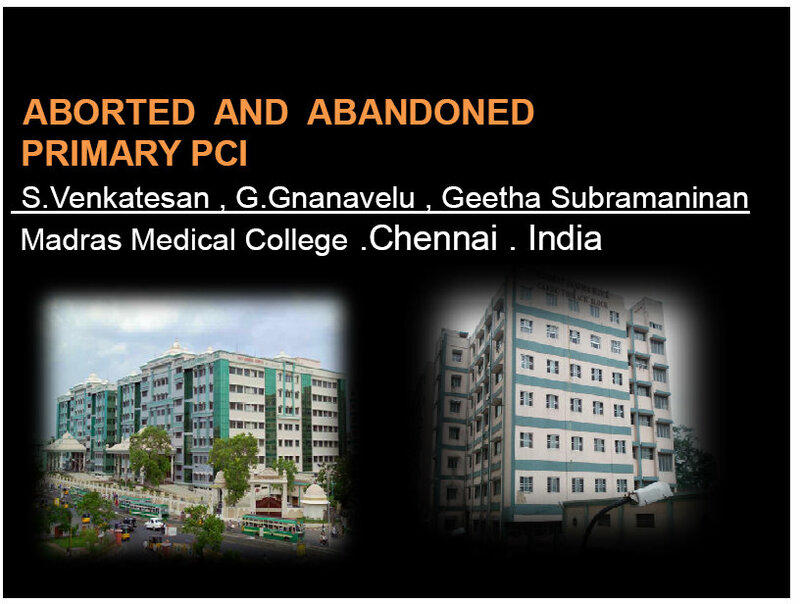 They were shifted out of cath lab with a new code of aborted primary PCI and were discharged with normal LV function .It need to be realised here, a distinction must me made between aborted PCI and abandoned or failed primary PCI as the later connote a negative outcome. The causes for abandoning primary PCI are due to complex lesions like bifurcation /Trifurcation lesions , triple vessel disease with difficulty in identifying culprit lesions.A Primary PCI is considered failed when the IRA patency is not accomplished or failure to sustain myocardial flow inspite of IRA patency (No-Reflow) . These patients may end up in CABG or occasionally fall back on thrombolysis which was considered a inferior modality just few hours earlier !
. We conclude , in the management of STEMI , primary PCI once contemplated need not always reach it’s logical conclusion. There are situations it can get aborted or abandoned at various levels . Aborted primary PCI due to spontaneous lysis though uncommon , can be a therapeutically and financially rewarding concept for the patient and physician .